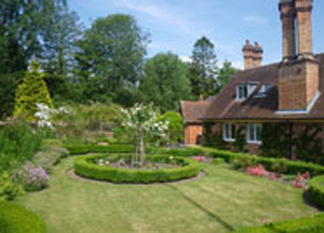 THE DONNINGTON HOSPITAL TRUST (otherwise known as The Hospital of Queen Elizabeth in Donnington) is the oldest charity in Berkshire. Founded in 1393 by Sir Richard Abberbury, the Trust manages 67 almshouses and provides pensions to retired people in need. The Trust, which is managed by the trustees and it's present chairman is Willie Hartley Russell also makes charitable donations to a variety of local charities and organisations throughout Berkshire and Oxfordshire. 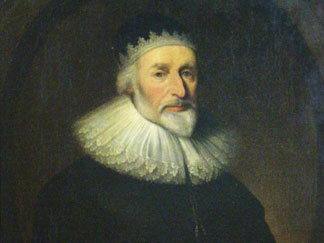 Sir Richard Abberbury founded Donnington Hospital by Royal Licence, granted by King Richard II, to provide almshouses for twelve poor men and a Minister. In return the almsmen were required: “to pray for the state of Sir Richard Abberbury, his sonne, and Anne his wife, all his heyres that live and for the soules of Sir Richard Abberbury, Knight, our founder and Anne his wife”. In addition, the almsmen were obliged to attend mass daily at Donnington Friary in the Chapel of the Friars of the Holy Cross (Crutched Friars) which was also endowed by Sir Richard Abberbury. Charles Howard, Earl of EffinghamSir Richard endowed the Hospital with the Manor of Iffley in the City of Oxford and it was from this land that the Trust devolved its income. The Hospital fell into a poor state of repair in the late sixteenth century. The Manor and Castle of Donnington had become the property of the Crown. 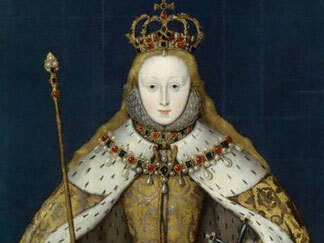 In 1600 Queen Elizabeth I granted the Manor to Charles, Lord Howard of Effingham, Earl of Nottingham for his part in the defect of the Spanish Armada. On 25th November 1602 the Queen made a Grant of Refoundation for the Hospital renaming it, “The Hospital of Queen Elizabeth in Donnington”. In return the Lord of the Manor is required to pay to the Sovereign: “a rent of one red rose to be paid annually and faithfully at the feast of the Nativity of St. John the Baptist” (24th June). A tradition that is maintained to this day. Groombridge PlaceIn the mid seventeenth century the Hospital was rebuilt and the affairs of the Trust continued broadly unaltered until the beginning of twentieth century. The expansion of Oxford provided the Trust with fresh capital. In 1938 the Trust built 13 almshouses at Abberbury Close in Donnington, Berkshire. In 1960 four flats were built at Iffley in Oxford. Twelve further units were built in Bucklebury, Berkshire between 1970 and 1983. In 1992 a new development of twelve almshouses in Donnington was built to commemorate the Trust’s sexcentenary. 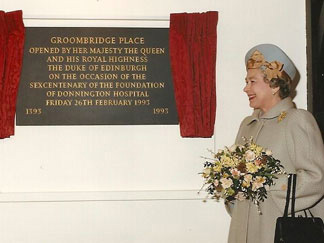 Her Majesty the Queen and HRH The Duke of Edinburgh opened the new almshouses and visited Donnington Hospital in February 1993. In 1995 the College of Arms granted supporters to the Hospital’s Arms. In March 2010, The Worshipful Company of Fishmongers transferred Jesus Hospital Bray to Donnington Hospital Trust. Jesus Hospital consists of 17 Grade I listed almshouses together with a chapel and is located in the village of Bray. Jesus Hospital is a Grade 1 Listed quadrangle of 17 almshouses in the centre of Bray. This has taken the number of almshouses under the Trust's management to 67. Donnington HospitalThe work of DHT is self financing and we receive no public funding. The Manor of Iffley together with other property in Oxford and Berkshire provide the income to support the work of the Trust. The Trust provides almshouses to married couples, single men and women who are of retirement age, of good character and of minimal means. Residents are looked after by wardens although no nursing care is provided. The Trust is the 23rd oldest recorded charity (out of 185,000 charities) and the 10th oldest almshouse foundation in the country. It remains, however, very much a family charity. If you would like further information about Donnington Hospital, please contact the Clerk to the Trustees, The Trust Office, Groombridge Place, Donnington, Newbury RG14 2JQ (Tel 01635 551530).